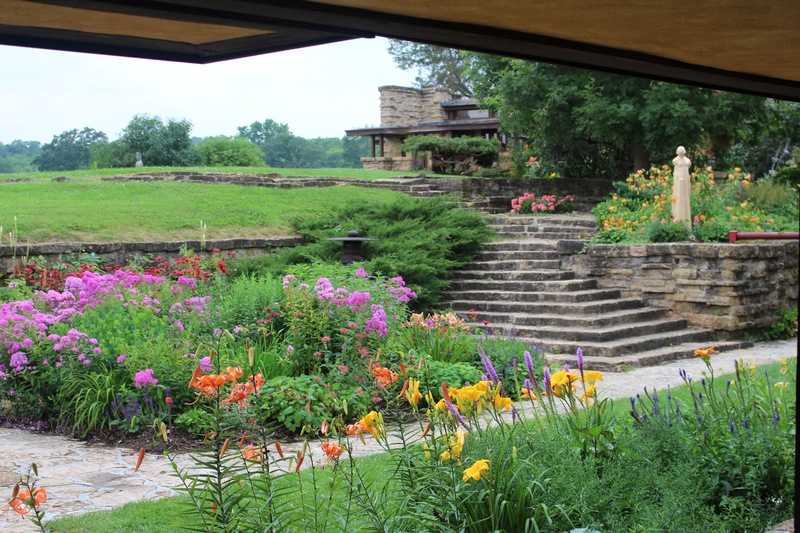 I didn’t completely get, when Angie signed us up for the top level tour at Taliesin, exactly what that involved. 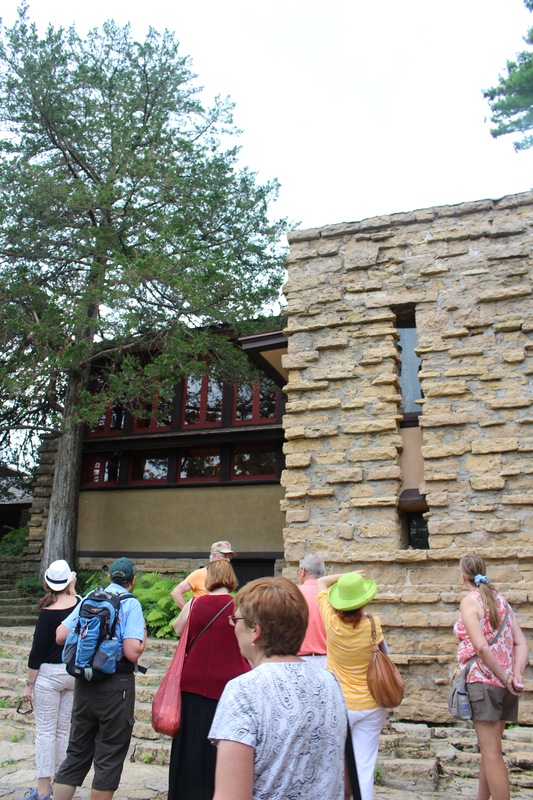 It was the whole Megillah, a walking tour of a huge part of the estate, and not just the house that had been Frank Lloyd Wright’s home in Wisconsin for much of his creative life. 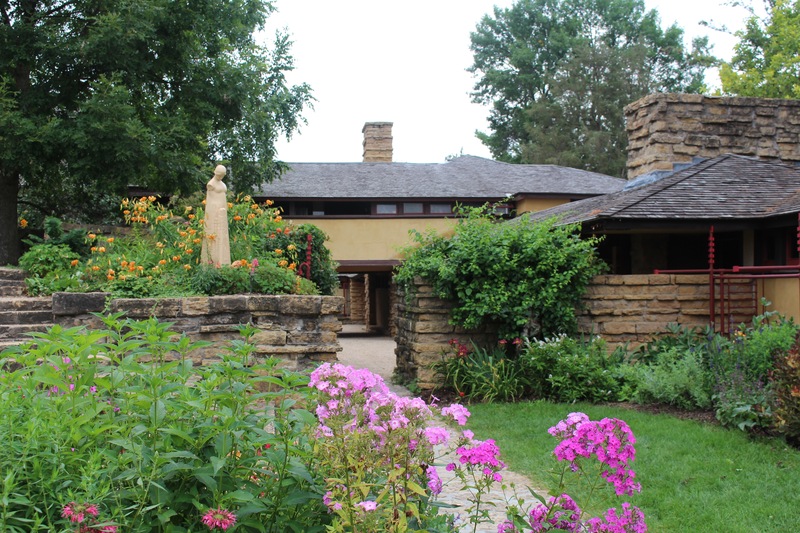 I also did not know that Taliesin became an architecture school, with studies now divided between this location and Taliesin West in Arizona (on the bucket list for sure). I’m so glad we saw as much as we did, even though it was rather overwhelming. A bus took us from the visitors center up to the first stop, but after that, we were traveling by foot, and it wasn’t flat! The pace was pretty mellow for us, but a couple of people apparently hadn’t read the description fully and struggled with the walking, though it wasn’t unbearably hot. And before I get into the day, one of my usual digressions. What, you may wonder, did we do with Rebbe while we were taking the four-hour tour? Well, my super resourceful wife had located a doggy day care facility in the town of Spring Green, which is close to Taliesin. Spring Green Pet Resort took our reservation a few weeks back too, and we dropped Rebbe there before heading off for our big day. The first stop on our route was the Hillside Home School. 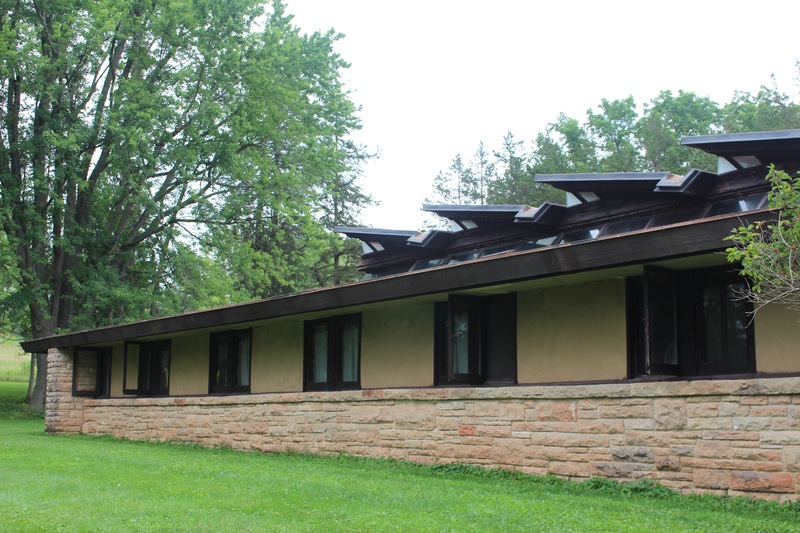 This was an early building Wright designed for his aunts, who had returned to where they had grown up to run the school. The building is now part of the architecture school. The highlights of the building are the assembly hall, theater, and drafting room. We weren’t able to take pictures inside anywhere and some things are hard to describe. The drafting room is gigantic and heads some cool design features of its own. It’s where the students do most of their work I think. 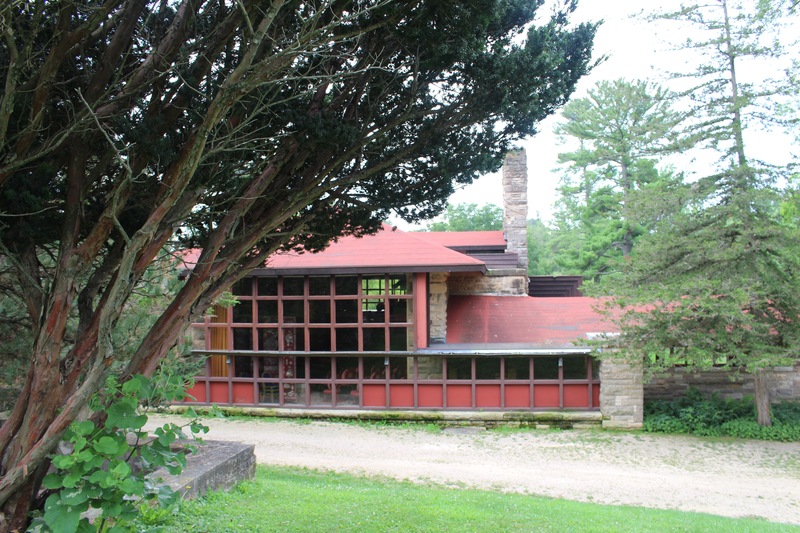 The essence of what Wright was trying to do in much of his work can be seen in this building, which was his first major undertaking. He was very focused, and many people reading probably already know this, on an organic approach. He tried to tie his designs to the earth in different ways. 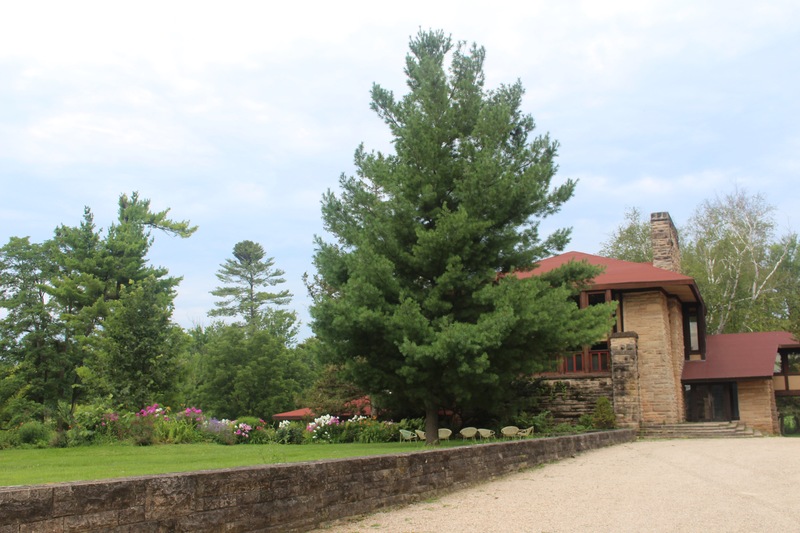 One example of his approach came out at the Hillside Home School, when he was upset that the stonemason added a cornerstone to the building naming him as the architect. 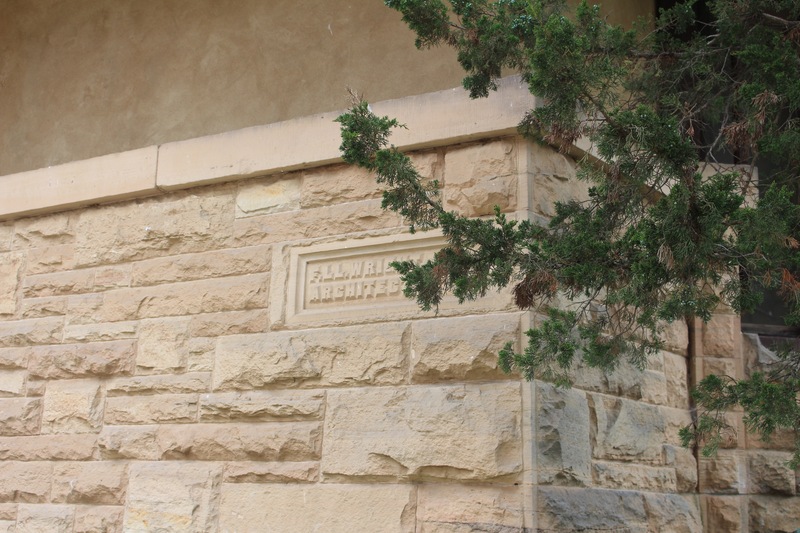 He felt this wasn’t organic, though he did consent on some buildings to have a small tile with his initials in a few of the buildings he designed, because he felt that was ornamentation. What Wright subsequently allowed to be used. 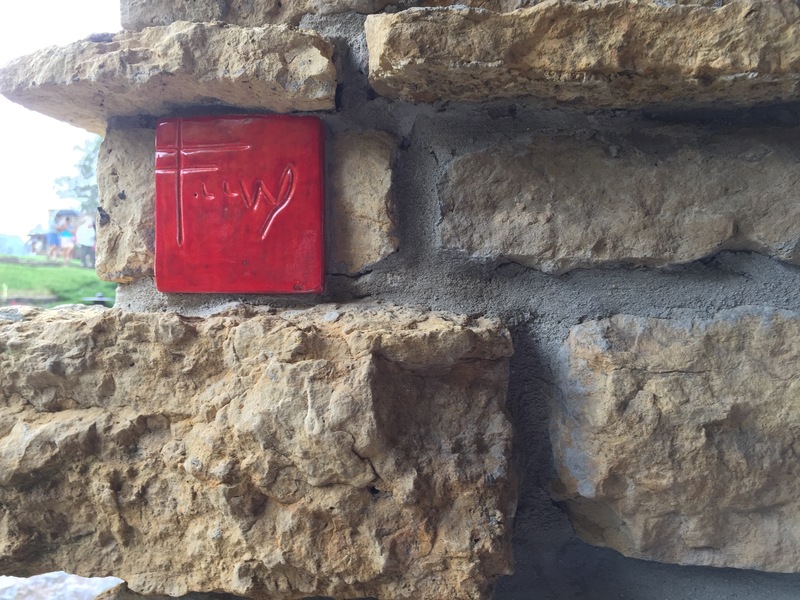 On this part of the tour we also learned that in 1936, Wright stopped designing buildings at Taliesin to take account of winter in Wisconsin because the school and Wright moved to Taliesin West for the winters from then on. The buildings would be winterized and would stand empty until everyone returned. 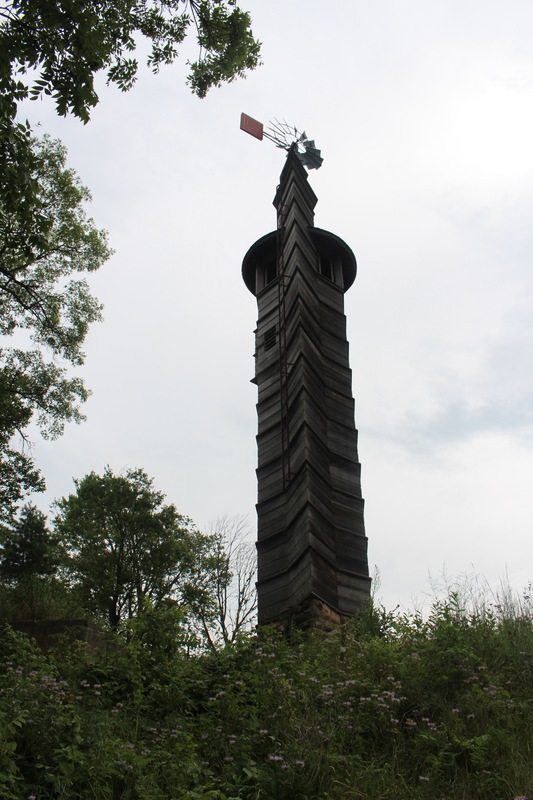 From the home school we walked up to the structure Wright called Romeo and Juliet, a windmill/pump designed to send water to the school. Wright insisted it was a very American Romeo and Juliet because he designed it as a happy ending. Our guide said Wright got a lot of criticism for his design of this structure, but Wright said it would still be there long after his critics were gone. Tan-y-Deri was the next stop. This was a cottage built for his sister and her husband. It was not as spectacular as the home school or anything we were about to see at the main house but it was part of the broad coverage we were getting. Our guide also talked about the adjacent Engineers Cottage, which was built in 1934. 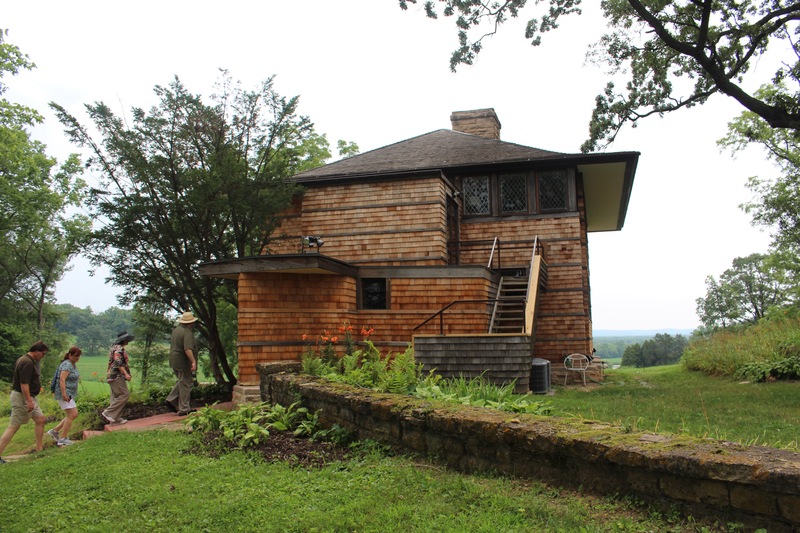 It was a cute little structure and you could see Wright’s influence even though he didn’t design it himself. 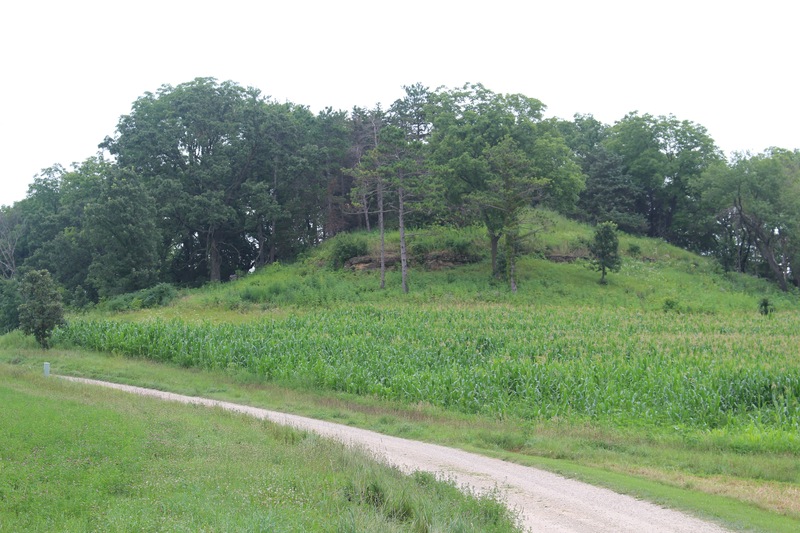 We continued walking toward the main house, passing Midway Hill, which had a brow that is reminiscent of name of the place (Taliesin means shining brow in Welsh). 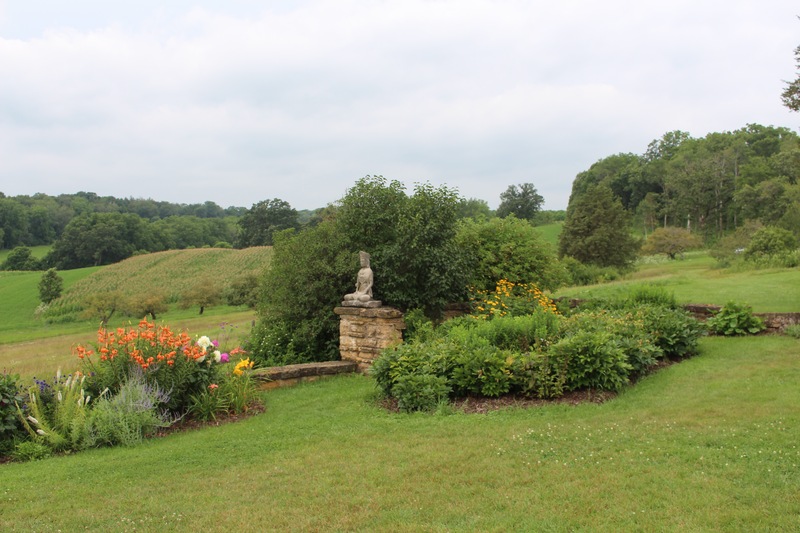 The brow was about 5 feet wide, which was a motif used by Wright in some of the terraces in the main house. 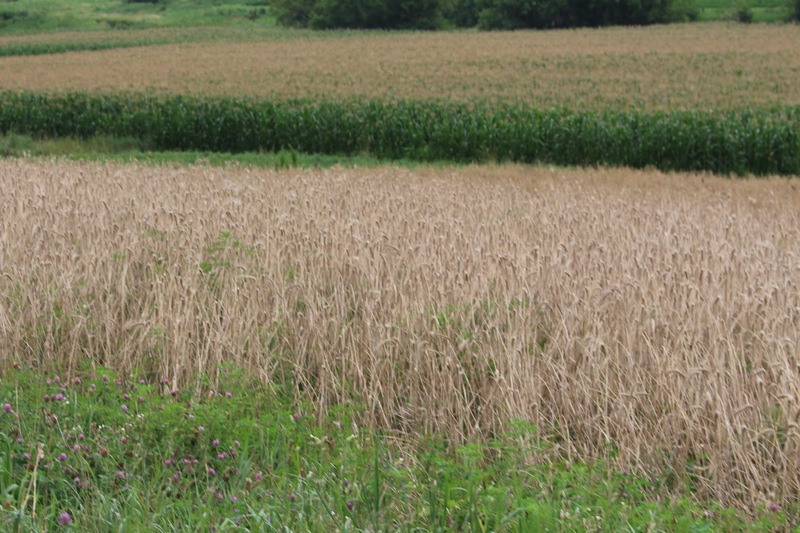 The land is now leased to an organic farmer, who uses “weeds” to fight pests, but plants them as they suit the crops and needs. 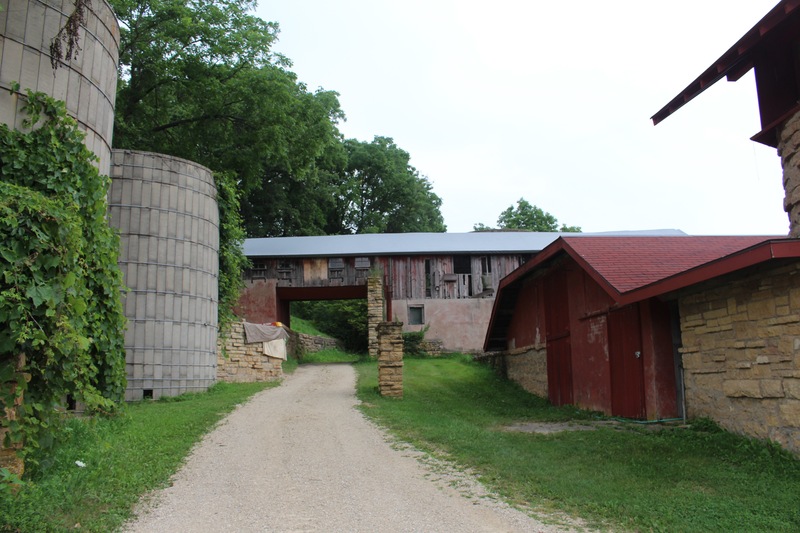 Wright’s farm had Guernsey cows, Rhode Island Red chickens and Hampshire hogs because of their colors! These were colors that he felt were suited to the landscape. 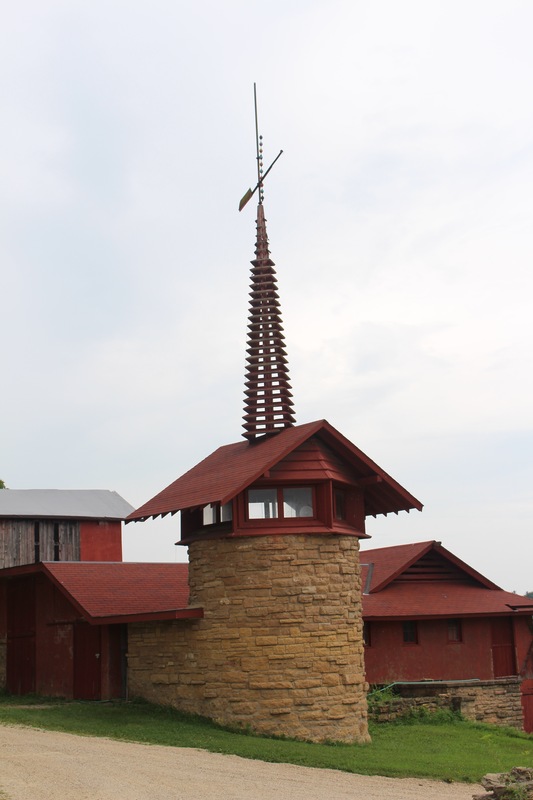 He also built a spire on the milking shed that was inspired by the Imperial Hotel project, for which he spent several years in Japan. 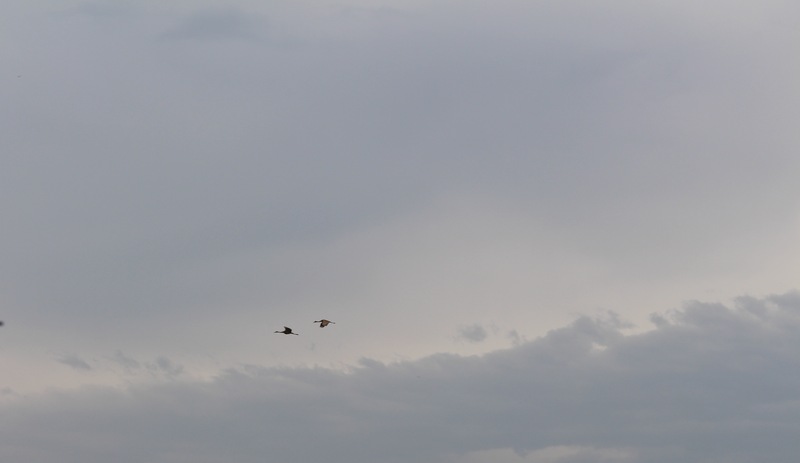 We interrupt the narrative for a bird picture: Sandhill Cranes! The power lines in the valley are underground, and there’s no commercial signage. 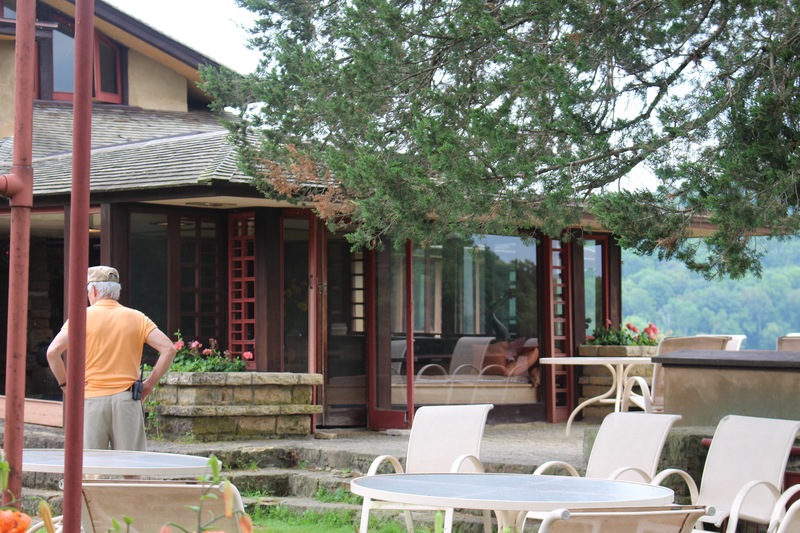 Because we were on the high-end tour, we were treated to drinks and cookies when we arrived at the main house. The cookies came from the cafe at the visitor center and were delicious. For drinks we had a choice of lemonade, iced tea, coffee, and water. 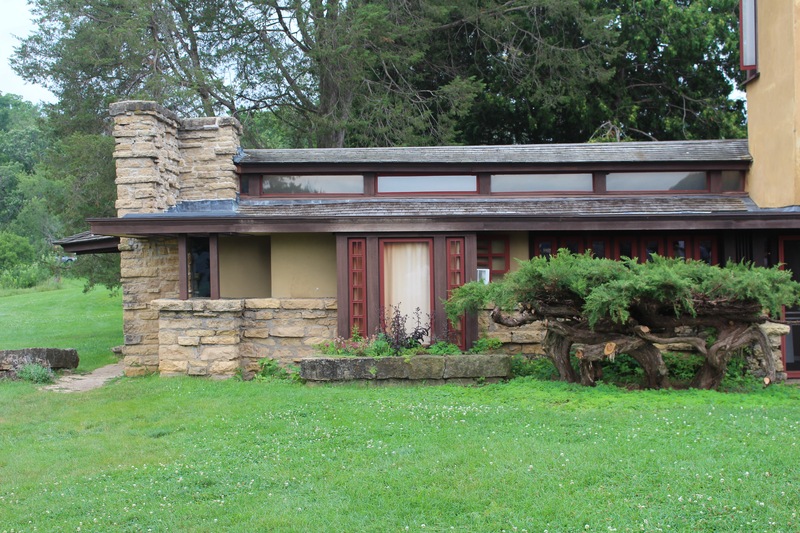 The main house, Wright saw as his lab, and his apprentices worked on it, so there is less consistency in features and design. He redid elements of it in the 1950s. 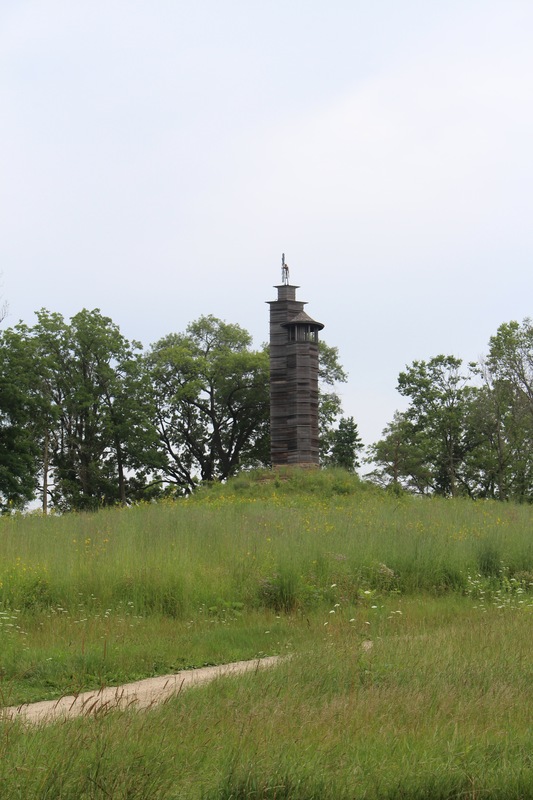 The Ice house tower was one of the early structures of the main house and was not destroyed in the 1914 fire. In 1914 a fire was set by a disgruntled/maniacal servant. He set the fire and killed Wright’s mistress and her children as they tried to escape. Others died of burns sustained in the fire. The second fire was in 1925, caused by an electrical problem. Wright was there and tried to save the property, but much of the house was destroyed along with many of his valuable pieces of Asian art that he’d collected while in Japan on the Imperial Hotel project. The House was expanded over time. There are four courtyards, all with a continuous line of sight. 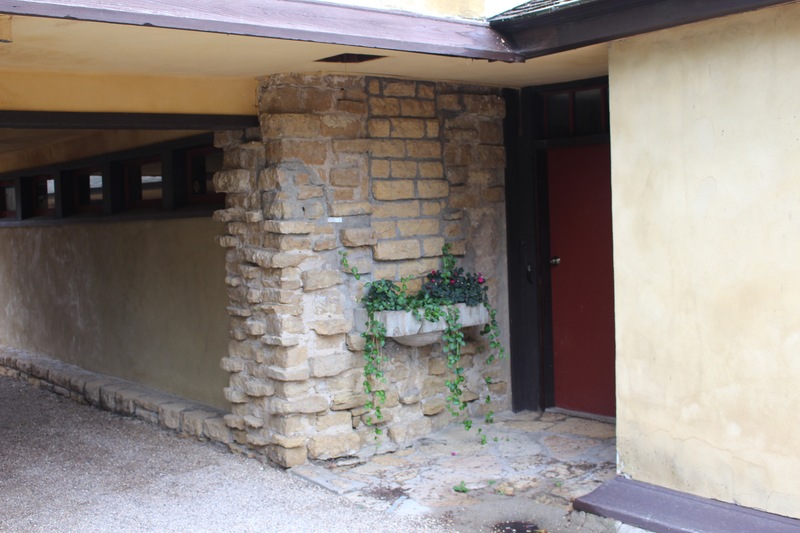 The first was built when people mostly traveled by horse, and a port cochere was there that was later converted to a garden room, and then again into a library. The terrace outside what became the studio in the house is forty inches, a reference to Fallingwater, which is one of Wright’s most famous houses and clearly an obsession to him, since there are other references at the house. Our guide pointed out an apprentice wall near the front entrance, which Wright kept in place as an example of what not to do, in keeping with his view of the house as a lab. Wright had started as a builder and felt that his apprentices should have practical skills to inform their training and work. 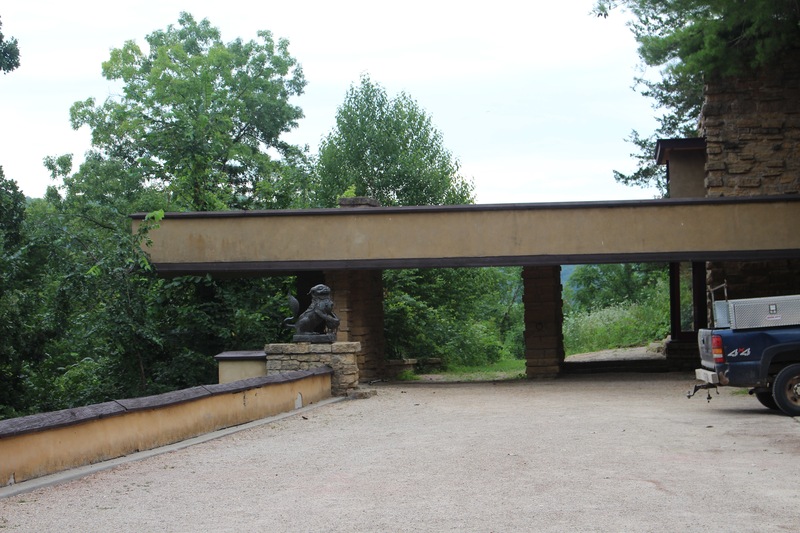 The main entrance to the house was added in the 1940s because Wright wanted a better entrance now that cars were more common, though he loved to ride and there were also tie ups for his horses add the main entrance. The entrance had three sets of seven steps, which may have been a musical reference. Wright and his family were very musical. He had many pianos and played often. The main house had four chimneys in two angles. The car court in the back was added in 1925 after the second fire. 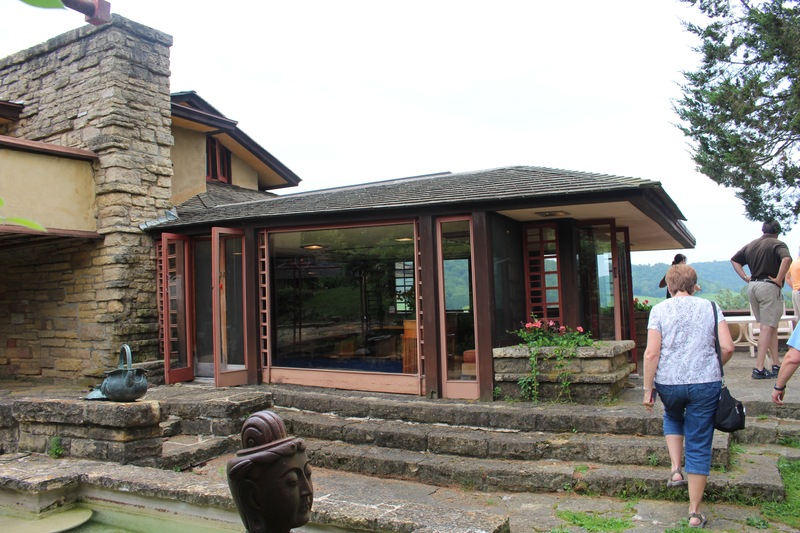 We saw the drafting studio, where Wright sketched out Fallingwater in three hours. Our guide said conceived, but what he meant was that Wright had been developing it all in his head and then the owner was coming to visit so he had to put it on paper. What he sketched was the outline for what that great house came to be: supposedly 90% of how it came out. 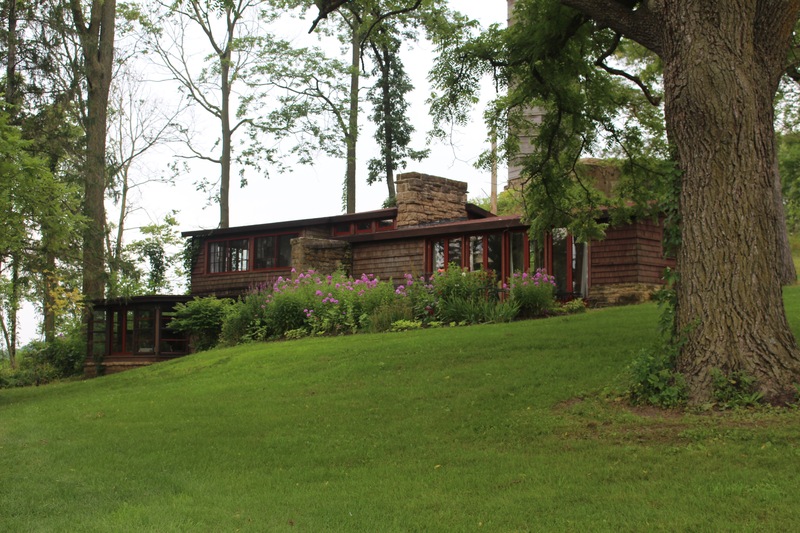 The drafting studio was in the main house till 1937, when it was moved to the Hillside Home site. Some more pictures of the main house. There are so many details to take in at the main house, especially inside. 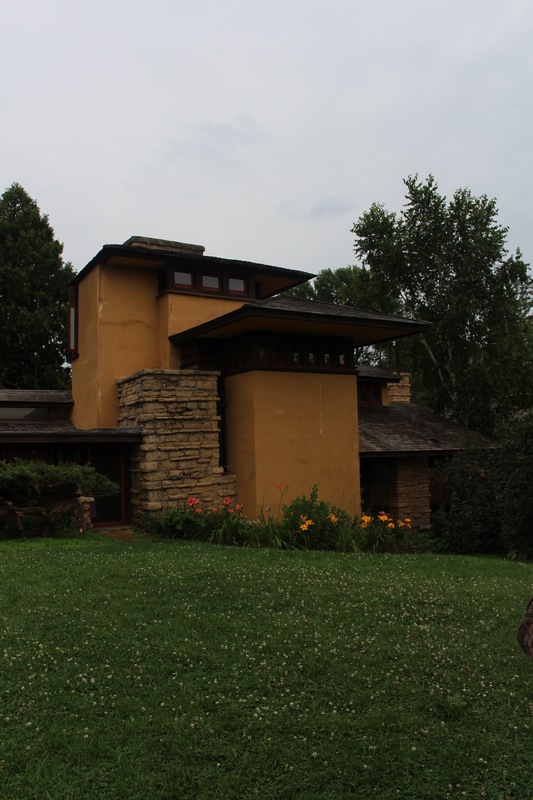 Wright used three main colors that he saw as organic to the area, a sandy color, Cherokee Red (for a local stone) and one other we can’t recall. There were red stones (fire damaged?) and Buddha heads that Wright salvaged from the 1925 fire. 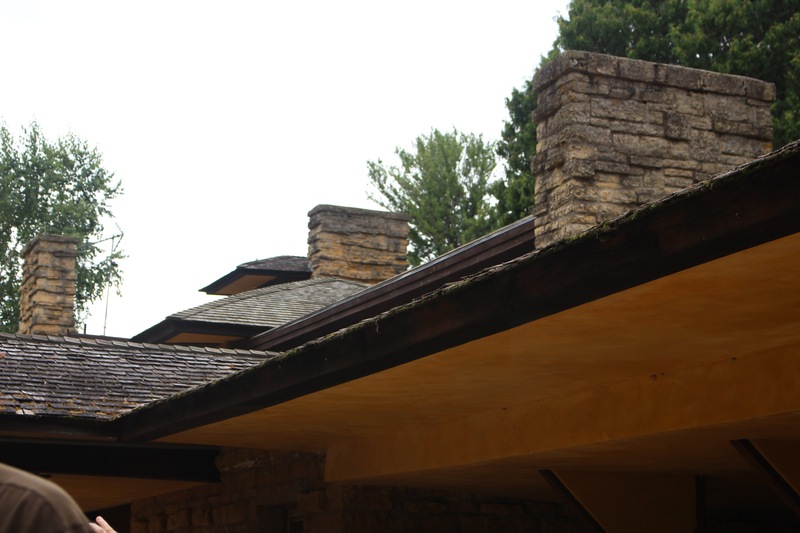 The main house had lots of points of connection to Fallingwater. 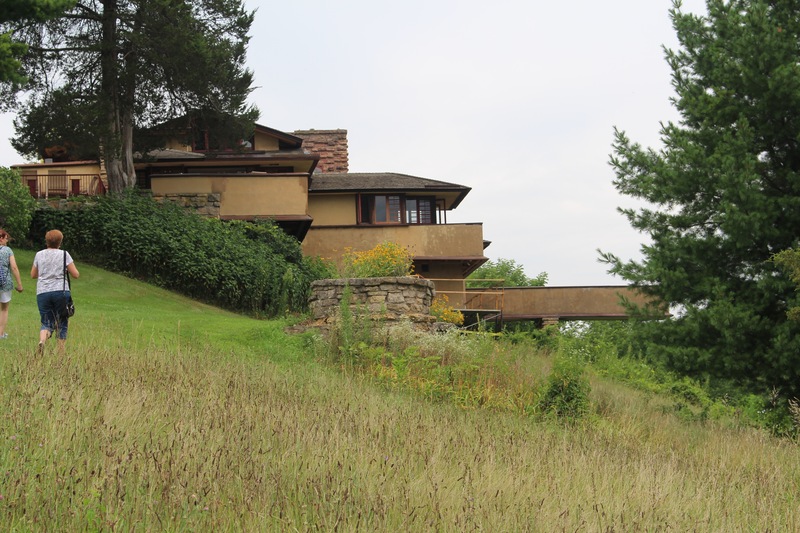 At that house Wright put in a whole floor of Shellac matching the piece he had in front of the fireplace of his great room at Taliesin. As with the courtyards, there is a sightline all the way through the main house from his bedroom to the other end of the house. Amazingly, Wright’s spectacular and spacious bedroom, includes a garish blue rug that is sixty years old (from 1950). It’s a precursor of what would be known as shag carpet in the 60s and 70s and woven in China. Interestingly, we were allowed on the rug, but everyone was wearing booties for the entire house tour. The shuttle picked us up at the main house so we didn’t walk back to the visitor center. We had one final stop on the way back, when the shuttle paused at the dam on the property. 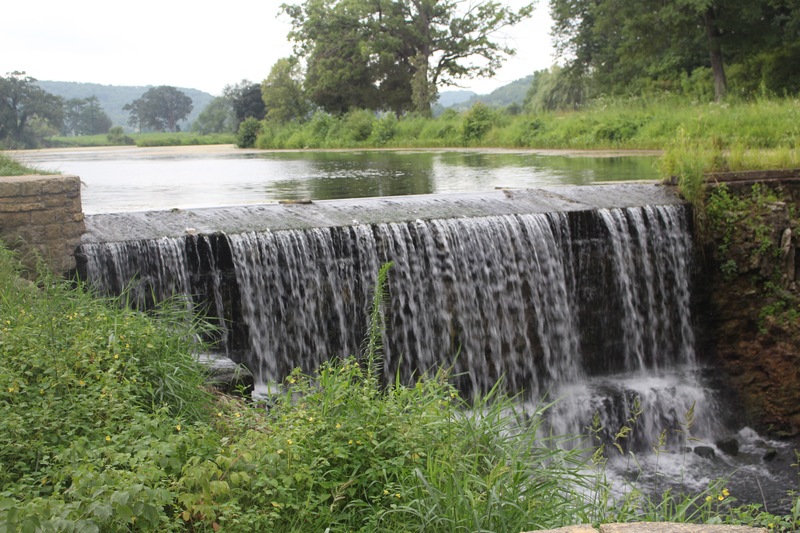 Apparently, Wright was too cheap to build the dam properly while he was running the estate so it failed failed twice. His widow had a proper one built after he died. After we finished the tour, Angie and I had a nice lunch in the visitor center cafe and checked pour the gift shop, which we found disappointing. Even the books on offer didn’t look interesting enough to splash out on. How was Rebbe’s day? He completely bonded with his caretaker at the doggy day care And had a fun time playing with the other dogs. The owner even posted his picture on their Facebook page. And Rebbe slept very well that night! I really enjoy Wright’s style. He was so innovative. Loved the photos! Thanks! We love his stuff also. I want to see some of his work and some of the Greene and Greene around the LA area before too soon.